Finally done – the binding turned out to be a very fiddly job – I decided in the end a single fabric binding would clash with the border no matter what fabric I chose because the gradation from the dark burgundy to golden yellow was so great. The solution: to have the binding mirror the border with the joins aligning as closely with the border slanting seams as I could manage it. It’s taken three days of measuring, sewing, unpicking, re-sewing, to make the joins look continuous. 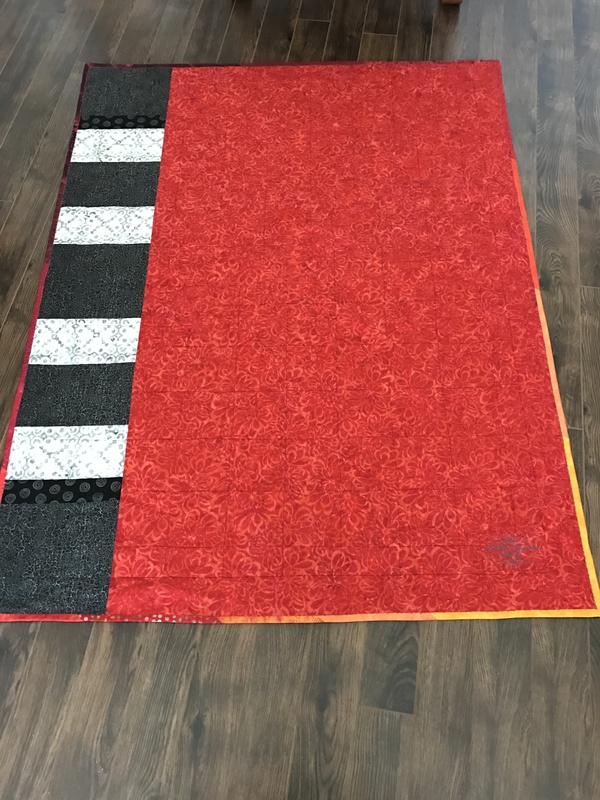 I’ve done a pretty good job although close scrutiny would show I missed by a wee bit on some of the connections but hey, this is a quilt after all, so I decided to live with the minor imperfections that showed up when I was stitching the binding on the right side. In the end I decided to piece a simple back since the front is so complex and for some reason (which I can’t explain) I thought placing the strip on one edge was what was called for. The binding I knew would also add some interest to the back. 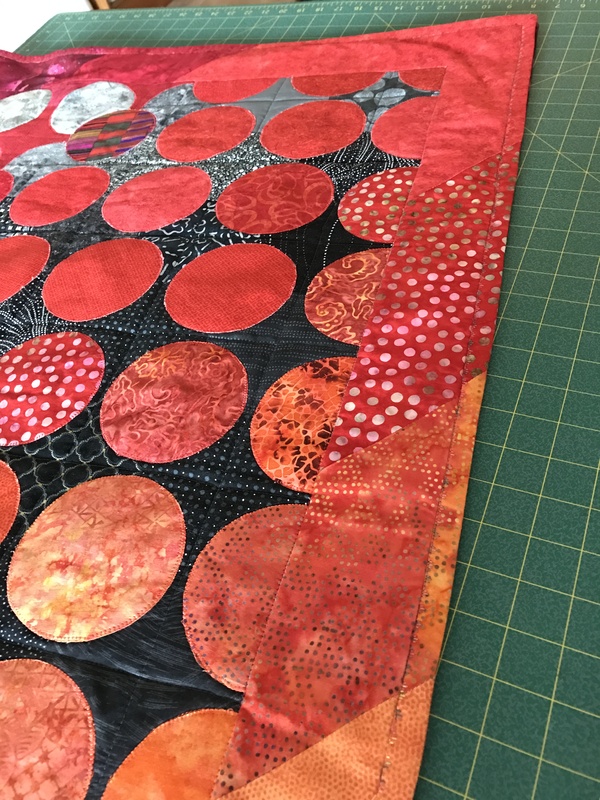 I quilted using straight vertical and horizontal lines midway between the circles. So far, I haven’t quilted the border although that is still a possibility. It’s probably a tiny bit wide to leave unquilted. For now I’m putting the quilt aside to move on to other projects. Stunning! I am very impressed by your binding! I have seen matched bindings but usually it is just one spot. This must have been quite a lot of work. The effect is amazing, though. Wow. 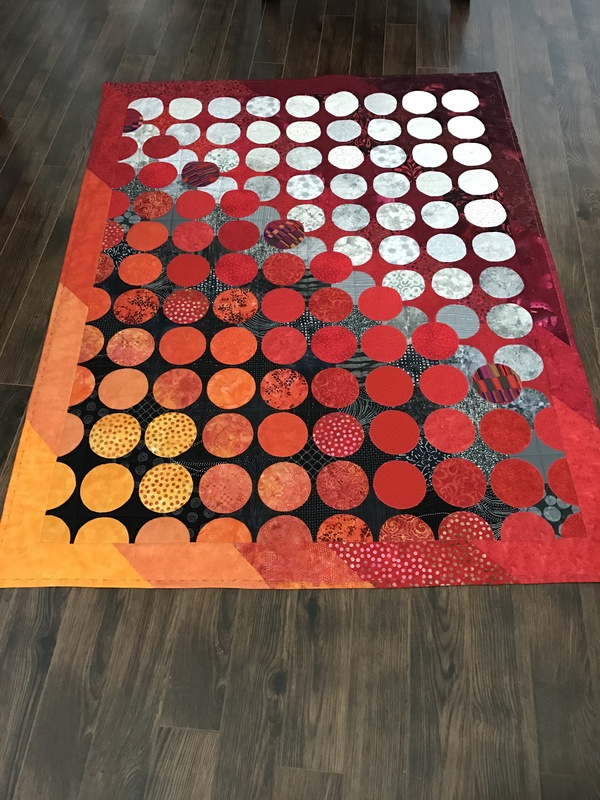 That is one ‘wow’ quilt! You seem to enjoy living on the wild side! And it looks good on you! I too love the process behind what I do.